The driver was worried. The snow was getting thicker by the minute and they appeared to be totally alone. In the last five kilometres there hadn’t been one vehicle, not even the police who did a regular patrol in these conditions. He was beginning to wonder if he should stop but, if that happened, the bus would lose its heat. He changed down and decided to continue as long as the reflectorised posts could still be seen. The bus had snow tyres so should be able to get through with all this weight aboard. The poles in front disappeared but Wayne knew this section of road. It went into a downward S shaped bend to a narrow bridge over a stream before climbing up the other side. From there the road levelled out and was easy going most of the way to Queenstown. If he could get over the bridge, they’d be right. Suddenly Wayne realised there was a red reflectorised post in front of him. He was on the wrong side of the road! He swung the wheel towards the centre while at the same time changed down, yet again, to a lower gear. The brakes gripped and the back wheels started to slide on the icy surface. Wayne swore, lifted his foot off the brake pedal and attempted to steer into the skid. A girl behind him screamed. The rear of the bus skidded sideways and the outside back wheels left the road’s surface and slid across loose gravel on the shoulder. All control was lost as the whole vehicle slid sideways across the road. The front wheels were also in gravel and the vehicle tilted. Without warning it careered down the bank next to the highway. Inside, girls were flung in the direction of the fall and hysterical screams filled the air. But the heavy vehicle had gain momentum on the icy bank The angle increased until the whole vehicle crunched, with a screech of protesting steel, onto its side. Inside, the passengers were hurled around like rag dolls. Screams were interrupted by anguished sobs as the bodies were smashed into each other, against the back of seats and windows. They jerked back as the bus bounced over some unseen obstacle and skidded to a halt twenty metres below the road. Tania’s recollection of what happened was hazy. One moment, she was talking to the two girls when she felt herself pitched forward over Andrea. She remembered thinking she’d crush the girl, as the side window seemed to rush straight at her. A sudden violent pain shot through her head as she hit the side, objects around began to spin and everything blacked out. She awoke to the sounds of screams ricocheting off her eardrums. She knew the bus had skidded off the road but had no other recollections. Next to her a whimpering voice filled the air. Tania shook her head, the spinning in front of her eyes subsided and she could focus. Everything was on its side and the voice was from beneath her. Tania turned her head and stared straight into the frightened eyes of the girl. The sheer terror in those eyes and the blood-covered face made her feel ill. As a policewoman she had attended quite a few accidents but they were impersonal. This was different. This youngster, only chatting to her seconds before, was now covered in blood from an unknown wound. “I can’t move my legs, Miss Brogan,” sobbed Kirstine. Kirstine was sobbing uncontrollably. Tania glanced at her and smiled encouragement. Tania manoeuvred herself around in the cramped space until she could see the red lever. It was just out of reach. She looked for a handhold, found the edge of a seat and swung herself up. From there she was able to reach it. “I’ve got it,” she called to the girls below and pulled the lever across while at the same time, pushing upwards. The door lifted, was caught in the wind and crashed against the outside metal with a loud bang. With a mighty heave Tania managed to pull herself up over the ledge of the door. It was freezing, but luckily she had left her gloves and coat on, though her woollen hat had disappeared. She stared around in the dull morning light and saw the whole side of the bus lying in front of her. Nobody was in sight. She gritted her teeth and pulled herself forward until she managed to sit on an ice-covered window. Snow was falling down in huge flakes. There wasn’t a sound. Yes there was! Behind, she could hear muffled cries and sobs. Tania edged forward onto the back wheels of the bus. The smell of burnt rubber and diesel fumes filled the air. She moved around the tyres until her legs were over a space before she gingerly lowering herself backwards. However, she began sliding on the icy metal. 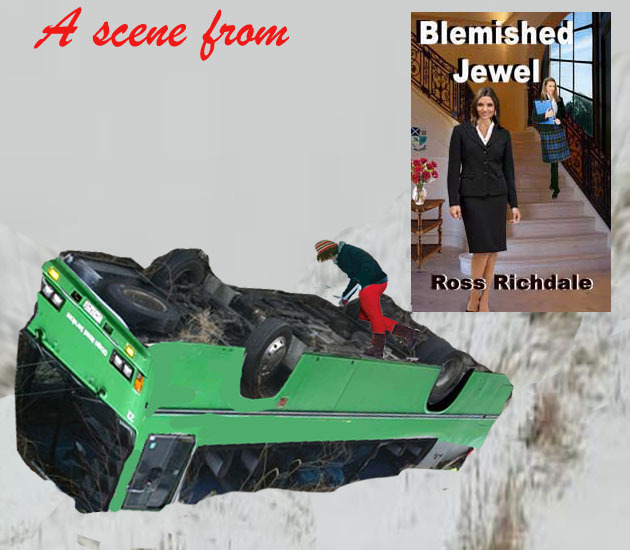 With a rush she skidded backwards off the side of the bus and crashed into a pile of snow. Luckily, it cushioned her fall so she wasn’t hurt. “Is anyone around!” she screamed. “Yes, Penny,” Tania shouted back. She stared ahead and could see the vague outline of the bank with skid marks in the sludge where they’d slipped down. Using all fours, she made her way slowly up the icy bank. Her face was so cold it had turned numb and her eyes were smarting from the icy snow pelting into them. Handholds were almost impossible to find, her tracksuit was soaking but she ignored the discomfort. It was all up to her. As far as she knew, nobody else had managed to climb out of the bus. Her legs slipped and she started to slide back down. Frantically, she swung her arms out and managed to grab a piece of tussock to stop herself. She was now lying on her stomach. She swallowed, moved forward and managed to bring her knees up to a crawling position. Finally, the ground levelled out and Tania noticed one of the road shoulder posts. She had reached the top. She stood up and turned. From the roadside the whole bus could be seen. The front was crushed against a large rock but the rest seemed to be undamaged. Muffled screams, sobs and voices filtered through to her ears. She saw Penny and another girl sitting on the bus while a third person climbed out the door. This seemed to be the only exit out of the bus. Penny waved and shouted but the voice was carried away in the wind. Tania turned and stared along the deserted road. There was nothing in sight. Everything was obliterated by the snow. She looked in the opposite direction to a similar scene, but was it? She squinted. Beyond some pine trees, was the faint outline of a building and a tiny rectangle of light. Penny waved back to acknowledge her signal and Tania headed off. The building seemed close but it wasn’t. As Tania plodded forward in the snow she lost all sense of time. Everything was deadly quiet as she plodded on. The weather was so cold her body would not stop shivering, her legs ached and now her head was throbbing but it was up to her. She was not about to give up. The young teacher blinked and wiped her eyes. There was nothing there! Nothing at all, only snow. Her toes were numb and she couldn’t feel her fingers. Her right foot began to tingle. The feeling increased in intensity until her whole foot was aching and throbbing. In her whole life she had never felt so cold. However, she was committed. There was no choice but to continue. The pain diminished and became more of an itch as the numbness returned. By now, even her winter jacket was wet inside as the snow found its way down her neck, melted and was absorbed by the material. But still she plodded on with only the markers along the edge of the road showing the way. The world of whiteness enveloped her. She blinked and raised her head. Something was different. The trees beside her had gone. A gatepost and the building appeared with the light streaming out like a beacon. With a little gasp, Tania turned and moved up what must have been a driveway. The snow was up to her knees. She needed lift a foot, move it forward to sink into the snow and then follow with her second foot. The land around began to move in and out of focus. It seemed like a dream. Perhaps it was one of those horrible nightmares and she’d wake up in cosy little apartment. She became disorientated. Where was the light? Had there really been one? Finally, after an eternity, her hand touched the rough side of a building. It was a house. She made her way along the edge to a veranda and finally out of the snow. There was a door, a bright green door. Tania stepped forward on the wooden floor and knocked. The exhausted teacher waited in despair and was about to try turning the doorknob when there was a squeak and it opened. A blast of warm air hit her face and she made out the vague image of a woman staring at her. The brave woman gave a tiny moan and collapsed on the doorstep. She had obtained help but her stubborn body could take no more.